A couple days ago it was still summer. The sun was shining and I was on my bike whizzing over to the next large neighbourhood over, the one where I lived for years when I first moved to Vancouver. Commercial Drive. The name itself doesn’t inspire a whole lot of sympathy for people who aren’t familiar with this city. For others who are, it’s marked as that hippy/old-Italian ‘hood over on the east side. But for me & many others like me, it’s a place that makes my heart go pitter-pat. In the 8 years I lived “On The Drive”, I’ve lived in 4 different apartments scattered within just a few blocks from each other, with a roommate, a boyfriend and finally, on my own. And while I love Strathcona, where I’ve lived for 6 years, there is something that keeps pulling me back. The food. The markets. The coffee. The best thing is that it’s just a short bike ride away. Those Granny Smith apples up there? They came from the Okanagan by way of the Santa Barbara Market, which is by far the best produce market on the Drive, in my opinion. I managed to fill up both panniers on my bike with beautiful local fruits and vegetables (plus a big container of almond milk) for a mere $15. When I got home I was at a bit of a loss of what to make for dinner. So I munched on an apple and waited for inspiration. When that didn’t produce any results, I dug into my archives and found this millet, chickpea, broccoli & tahini lemon salad which was inspired by a dish from the always wonderful 101 Cookbooks. While this salad is delicious, I wanted to mix things up a bit. Instead of chickpeas, I threw in some fresh corn for sweetness. 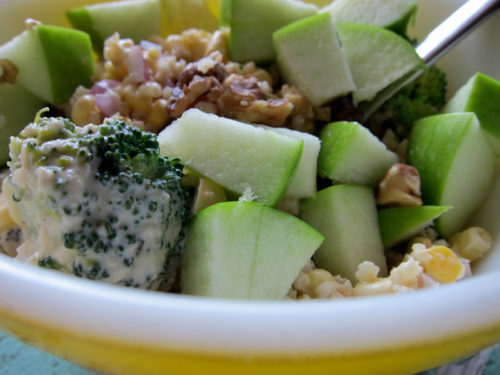 I also topped the salad with big chunks of apple and walnuts to give this salad more crunch and texture. And it worked out well. I didn’t mess with the dressing but I used what I had on hand and it was healthy and filling and tasted great. Cherry tomatoes would be a great addition here too as they’d go so nicely with the corn, so if you want to skip the apples, add in tomatoes instead. 1. Toast millet in a small saucepan until it starts to crackle. Add stock or water, cover and bring to a boil. Reduce to low heat and let simmer until millet is dry. 2. Steam broccoli until bright green, drain and rinse under cold water. With a large knife, remove the corn kernels from the cobs. Add corn, broccoli, red onion, lettuce and millet into a large bowl and toss. 3. 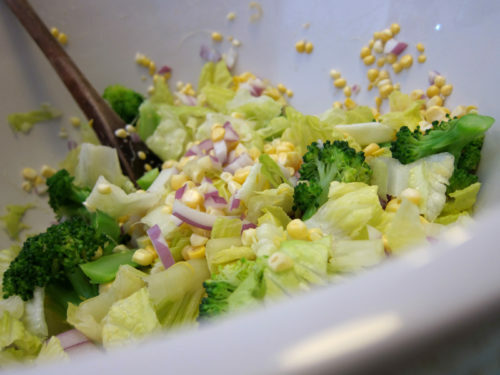 Make dressing by combining all ingredients, adding more hot water if necessary to get proper dressing consistency. Add half of dressing to millet mixture and blend. Top with apples, lemon zest and walnuts. 4. Serve salad in deep bowls or on a large plate. Drizzle with remaining dressing, if needed. Love the first photo. Such a great shot with the sneakers in the background. Excellent composition. How funny! I am visiting Vancouver this week, and we picked up some groceries for the friends we are staying with at Commercial just last night! It is indeed an amazing place – so much selection and such good prices on all the lovely organic stuff that is quite dear at home in Toronto. I’m cooking dinners for a friends, as a thank you, and it has been so much fun to cook with such lovely, healthy, delicious ingredients. Especially after the week we just spent in Vegas, which was not so much about the healthy. 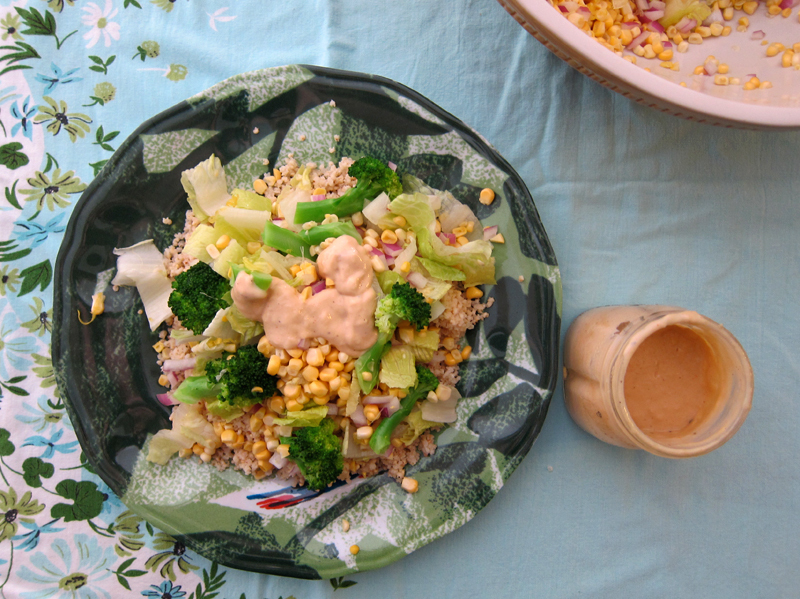 Making more simple grain and vegetable salads has been on my to-do list for a while. Thanks for the beautiful pictures and recipe to reignite my ambition. This looks great.. I’ve been a millet fan since the 60’s, when it was the super cool breakfast of all hippies..
Yum, this sounds delicious. I variety of textures in a salad is always important, and crunch is key! I love adding apples to my salads, and millet has become a favorite in my house recently. Farmer’s market days are truly my favorites. I love walking the four miles to the one downtown…it’s just awesome. I love all of the textures and flavors in this salad! A perfect use of farmer’s market goods! Millet eh? That looks so good, I might just have to give it a try. This looks great! I have yet to try millet. Thank you for the inspiration to try a new grain. I did a search for black beluga lentils and I found your blog! You rock, and so do your recipes! Thanks! Thanks Tracy. I had to get the shoes in since they are cute! ha. Glad it made for a good photo. Hooray for Vancouver! Beth, when are you going to move here 😉 Yeah, the food quality and prices are pretty awesome for such an expensive city! Elizabeth, I hope I can inspire a bit here! It’s a great little salad. RMWoman, wow! I’ve only been eating millet for a couple of years now, but I love it. Yes, crunch and texture are important, Jodye. Apples are the best. Thanks Joanne, it’s a tasty one. Ha, thanks Sues! It’s delicious and a bit on the unusual side of things. Haley, don’t be a doubter! Millet is tasty and I like it much better than quinoa. Newlywed, give it a go. It’s great! Seems millet has become very popular lately as I had a hard time finding some this weekend. Checked out two bulk stores and still no luck. The apples and walnuts are an excellent touch! I will make this when Toronto decides to re-stock on millet, hee! This looks so good! 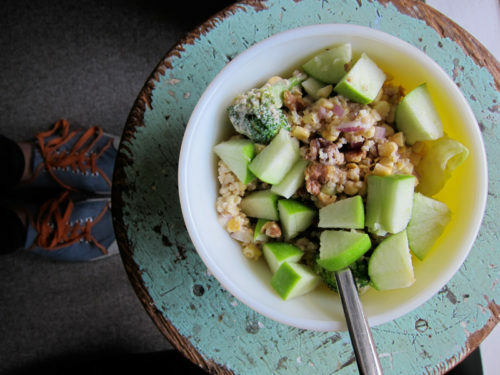 I love the addition of walnuts and apple…love the first photo too with the shoes! Your creativity is very inspiring. I am not great at coming up with something so delicious on the fly. Bijoux, I’m surprised that it’s so hard to find. I don’t buy it in bulk, but it’s easy to find in my local shops. Shape up, Toronto! Aw thanks Dana! I go for the slap-dash approach and would love to make something more elaborate sometime soon. I love salads like this! Thanks Ashley, it’s a good one.